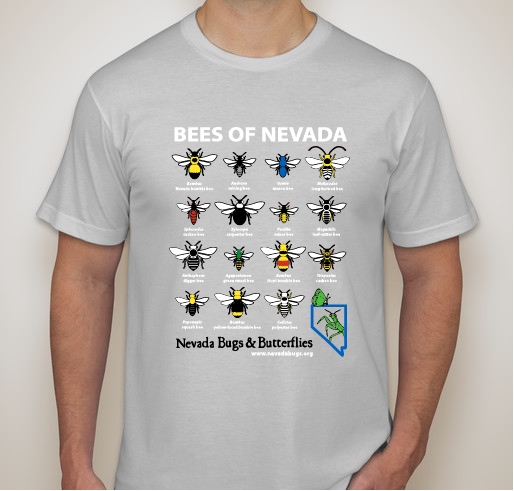 Nevada Bee-Shirts: Celebrating Pollinators of the West! Show your support for native pollinators and the incredible bee diversity in our state! All proceeds go directly towards quality science education in northern Nevada, including pollinator education and our free seasonal Science Center and Butterfly House. All funds raised will go directly to Nevada Bugs And Butterflies . *Please note, these American Apparel shirts run very small. For the unisex cut we suggest ordering up a size. The women's shirt is called a "Juniors" cut and we recommend ordering up two or three sizes. Nevada is home to over 1000 species of native bees that are important pollinators of both wildflowers and many food crops. They come in all shapes and sizes, and they can be found in a wide variety of habitats. Despite being so important, bees are often misunderstood and many populations are in decline. These shirts are a special release in order to celebrate the incredible diversity in color, shape, and size of these amazing invertebrates, and they are a great way to highlight your support for the tiny pollinators that work hard every day to help create a healthy ecosystem. Nevada Bugs and Butterflies is proud to support quality science education about native biodiversity in our area, and we provide pollinator education throughout the year. Proceeds from this sale will go directly towards our various educational programs, including workshops, talks, and take-home actiities at our seasonal science center, like making your own native bee habitat! We are grateful for the continued generosity of our many supporters and we than you for your purchase! 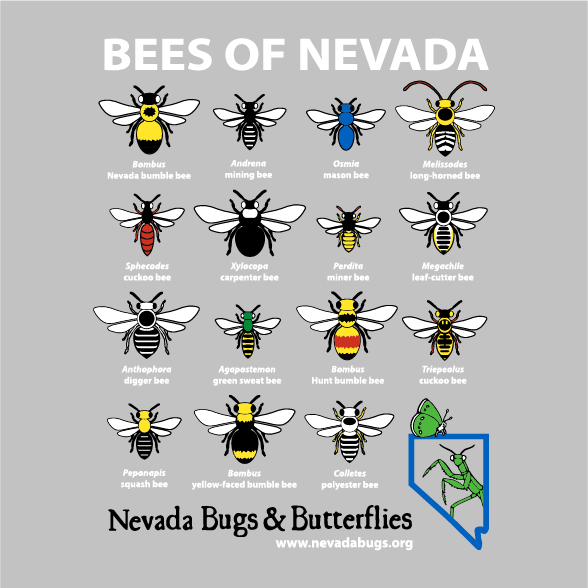 Nevada Bugs and Butterflies is a Reno-based science education nonprofit whose mission is to provide hands-on experiences with science and living things in order to cultivate love of the natural world and local environmental responsibility. Our seasonal Butterfly House and Science Center will open for its 4th season on June 16th 2016. Please visit our website, www.nevadabugs.org, or check out our facebook page, http://www.facebook.com/NevadaBugsAndButterflies/, to find out more about the programming we offer and how you and your family can join us at the Butterfly House and Science Center in summer 2016! I love bugs and butterflies! Such a great resource! So grateful for NVB&B's existence and all they give to the community (natural and human) through their work! 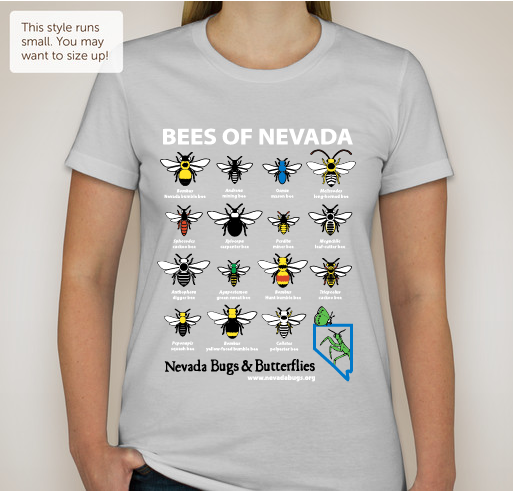 Share Why You Support "Nevada Bee-Shirts: Celebrating Pollinators of the West!"